I realize I’ve been slacking (again) with the geology word of the week(ish)- my apologies! I’ve had an extra busy travel schedule past two months– one of the many perks of being a geologist, for those of you who might be considering the career. I really enjoy travel, and I especially enjoy traveling for geology. First of all, it’s usually free (for me!). As a quick aside, if any of you are American taxpayers or contributors to Woods Hole Oceanographic Institution, I want to thank you for all of the free trips I’ve gone on thanks to your tax dollars/donations. Much appreciated. My parents think I have a scam- my dad jokingly threatens to call up the US Government/WHOI donors and complain about misuse of funds when I’m able to go on an interesting trip. He’s just jealous, I think. Secondly, I enjoy traveling for geology because it’s travel with purpose. I don’t randomly wander the globe, I go to a place with a purpose– to do a specific set of fieldwork, to attend a conference, to see a particular type of rock, and so on. Most of the time, the goal of the trip is to find a rock. Not just any rock, but a rock that I’ve deemed special for whatever reason. The hiking I do on these trips also has specific purposes: I’m trying to get to a place for a reason (*cough*a rock*cough*). When hiking for pleasure, I usually have a goal but often when I’m tired or hot or hungry, I don’t push myself to go as far as I originally planned. When I’m hiking to see a garnet peridotite, on the other hand… well, let’s just say I’ll hike all day and night if necessary. You get the point. Travel with purpose. I like it. I am glad to- finally- have been home for a few days though after all my trips. However, tomorrow morning I leave for The Amaz!ng Meeting 8 in Las Vegas. So, I’ve got one last trip before I settle into about two months of labwork. I’m really looking forward to TAM, and I hope to see many of you there! Once I’m back from Las Vegas and settled into lab, I promise to give you (to the best of my abilities) two months worth of the Geology Word of the Week(ish) as well as some other tidbits. However, to keep you entertained in the meantime, let’s play a game! I’ll put some pictures and hints below, and you have to guess where I’ve been in the past two months. I will send a rock (perhaps a very small rock if you live overseas) to the first person to guess all of the places correctly. If you don’t want a rock, that’s fine. Perhaps it’s a bit of a lame prize if you’re not a geologist. Especially since there are very strict rules that you can’t sample the garnet peridotite I visited last month! Never fear, though, I have plenty of plagioclase peridotite and spinel peridotite… hmm… I think I better make peridotite one of my Geology Words of the Week(ish). Good luck, and see you in Vegas, I hope! Trip #3: First two weeks of June. I toured ophiolites in the mountains of two adjacent countries. In the first country, I was very excited to drive through the town of Chur, which obviously stands for “Chondritic Uniform Reservoir.” I never realized in my isotope classes that this reservoir is actually a town here on Earth. Fascinating! In the second country, I visited this beautiful little village… my favorite place we stayed! You should try to guess, Bjornar! I’ll tell you which ones you get right and which ones are wrong… and if my quiz is too hard, I’ll add some more hints/photos in a day or two. Wow. I got NYC – possibly took picture on Governors Island? The first and the last are the only ones I feel confident on. All pictures stolen from the internet… I did take pictures, but I am too lazy to post them. Switzerland is right, Holland is wrong. I award you 1.5 points. 2) Doesn’t look like the front of the Boston MOS, with the old, inaccurate T Rex, so I don’t know. And this is why I will never be a good skeptic or a good witness in a criminal trial. I saw the picture of Pierce and thought it was Darwin. I was so convinced, I didn’t check. Thus Shrewsbury. Seriously, I am so pathetic. sigh. this is the picture of Darwin I was thinking of…only not. 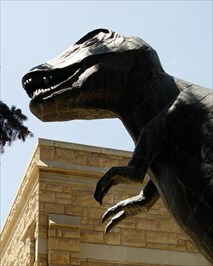 #2 I was gonna say Wyoming Dinosaur Center, Thermopolis, WY, just cause I’ve been there, even though it’s wrong. But I see Danarra has them all now. Danarra wins! Let me know if you want a rock. I’m back from Vegas and can send you a rock. Can you send me (or maybe Rebecca… not sure how this site works) a message with your address? Were you at TAM, Evelyn? If so, it should be MANDATORY that we all introduce ourselves to each other at events. I was probably just a stone’s throw away from you. Stone … rocks … funny … maybe not. And were you at the Skepchick party, and if so why didnâ€™t you say hi to Halincoh and I??? So many people so little time and more TAM regrets :-( . Yes, I was at TAM. No, I wasn’t at the Skepchick party. Yes, I realize that is lame. I did spend several evenings at the Del Mar Bar and go to the magic shows in the evening, though. Hope to catch you next year!